Brian was awesome!!! We had 450 wedding guests and the dance floor was packed the whole night. He goes over everything from start to finish to make sure you have the perfect time! He is very professional and always checked in during the planning process to see if we needed anything! I would highly recommend him! I would’ve been Lost without DJ BK!! Everything ran into one another smoothly and my guest had an absolutely amazing time, thanks to Brian and his MC. Brian and his assistant did an amazing job getting everyone hyped at our wedding. From start to finish always displaying the utmost professionalism and flexibility during such a busy time in our lives. I highly recommend him for all special events. Dj Brian Kelly played a very big role at my wedding. Two things in my opinion you cannot skimp on are music and food. I felt Brian was just wonderful! He was able to play all the songs I requested . He kept the dance floor going all night long. I was not a bride that wanted to dance but I wanted my guests to be dancing all night long, This goal was achieved. I also had ideas on how I wanted my opening walk in procession to be with my bridal party. It was a bunch of different songs that went great together thanks to Brian. The whole music experience really came out flawless. He also has wonderful props and will be glad to supply you with any props you request. Meeting with Brian was so easy. He is very charismatic and fun to talk to. He takes all your wedding music stress away. He is really helpful with getting your song list together because he's been doing this a long time. He has lots of experience. 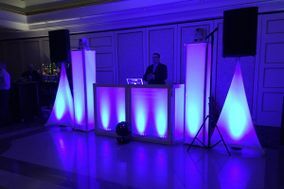 Thank you again Brian Kelly for making sure my music was rocking at my wedding reception! Brian was the MC and DJ for our 2009 wedding and was fantastic. He always kept open a line of communication and was able to provide guidance in how the various reception ceremonies went (i.e. introductions, dances, bouquet throwing etc.). My wife and I come from very different backgrounds (I'm Italian, she's West Indian) and our families had different tastes in music but he was able to accommodate both our families very well and was able to blend everything seamlessly. He was very professional throughout and receptive to our needs.